This post camFe about because of two things. First I have been thinking about Sharon B’s challenge for July (http://sharonb.wordpress.com/): “What is it to be at the half way mark? For me three word lead to a mix of ideas. “Half”, “Way” and “Mark” all lead off into interesting directions that can be represented in all sorts of ways.” I have decided that I am probably “half way” through my life expectancy, but I know I have not learned “half” of what I would like to know. In some “ways” I know more than “half” and in other “ways” I have not hit the “mark.” Will I leave a “mark” on this world? Sure…but is it “half” the “mark” I should have or could have left? This is a very thought provoking, and I’m glad I’m doing the color scheme for the month….I know this is a cop out, but what can I say…This question is much to deep for a gal who just came out of the June fog! And then second, when I finally remembered to registered with Stitchin Fingers (http://stitchinfingers.ning.com/) I thought about what lead me to this point and why do what I do. While roaming around here I came to realize I am but a grain of sand (and a small one at that) on a very large planet of creative people. There are so-o-o many wonderfully talented people in this world that I am constantly in awe. I realize how little I really know and how little I do compared with many of you so very talented people. One of my favorite teachers and mentor told me one time that you will never learn it all and if you think you have learned it all, you need to take up a new creative endeavor because you are not doing the your art justice. And my mother used to say you need to learn something new every day so the day is not a waste. So along these lines I think we can all learn from each other and in order to learn we must know where we came from… what lead us down this path? how did we decide to pursue our art? A friend says: “You are what your are because of those who came before you.” So with this thought in mind, here is my history…I look forward to reading yours on your blog or in my comments soon. 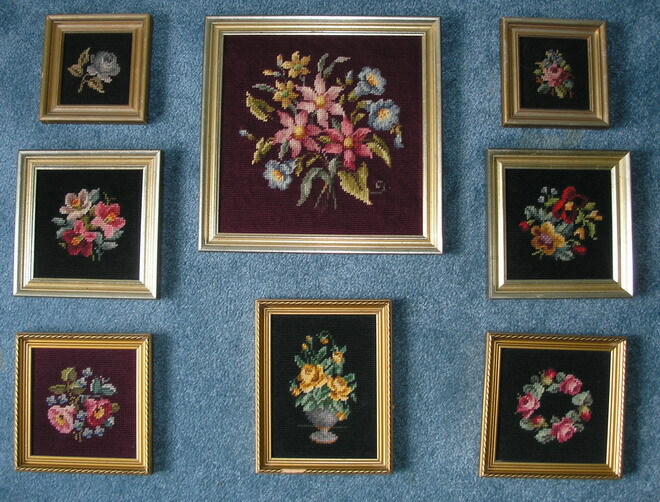 These are the very earliest needlepoint of from our family. The three lower ones are the oldest and stitched by (l-r) My Grandmother, Florence Gordon; Me: and My Mother, Jean Gordon Scott. The second picture is my very first needlepoint, continental stitch (some creative stitches too, and even a missed area or two in the middle (see them in the third picture?). But not bad for 8 -10 years old. The forth pcture is my second needlepoint and I didn’t miss any stitches this time, it is the top picture on the right in the first photo. The top pictures were the second adventure into needlepoint and a family affair…my grandmother wanted all of us to do pictures for her. 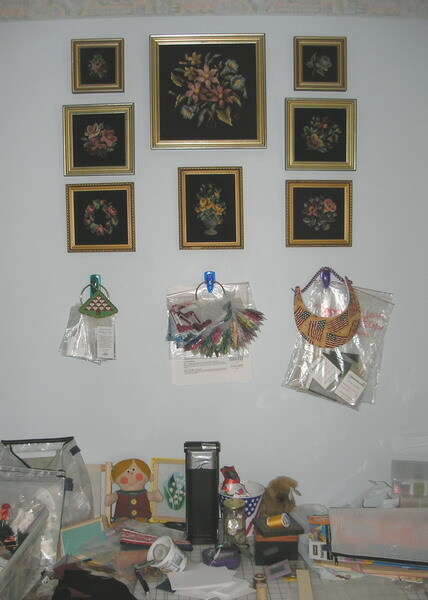 These hung in her bedroom until she passed and then my mother had them in various places in her house and now they all reside in my workroom (last picture). The first picture were stitched by: Top left – my cousin Melissa Gordon Dorssom; Lower left – My Aunt Donna Jean Gordon; Center my Grandmother; Top Right – me; Lower right my mother. I learned to sew from my Grandmother and school, made the traditional towel and place-mat and napkin for sewing & cooking class. I made the traditional blouse and skirt in high school. Learned all the basics in school but grandma taught me all the shortcuts and tidbits. I never mastered knitting in high school and still haven’t. But my main interests were not stitching but … boys and art… and probably in that order. Went to college and then married (in my 20’s)… I was more interested in making a nest than stitching. I still sewed for myself and did learn to hand smock thinking I have a daughter and make beautiful clothes…alas we have three sons but I had some great maternity tops. I also learned to crochet and tried quilting, macrame, decoupage, oil painting, enamelling, egg making… just about any craft of the day. 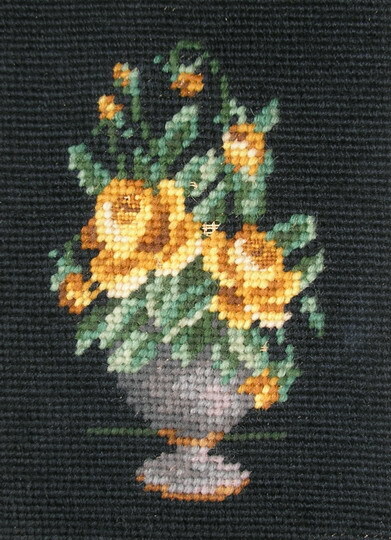 Then Christmas 1972 (Yes, I remember the date), my mother gave my this needlepoint book for Christmas. Needless to say I thought this was a strange gift but it was one of several so I just smiled and said “Thanks.” When I asked her why she gave me this book she smiled and said, ” I forgot to tell my book-club not to send it and I didn’t want to return it.” Destiny! The following summer 1973 our youngest son was hospitalized with unknown illness and it was a scary time. A friend brought me a Family Circle to read and one of the articles was: Teach yourself to needlepoint. I decided to try needlepoint, I sent my friend to a needlepoint store to by me three colors of wool, a piece of canvas, needle and scissors. Told her where the needlepoint book was on my cookbook shelf in the kitchen. If I was going to learn to needlepoint it was going to be more than 5 stitches. These are the two pillows that started my current adventures into learning needlepoint. 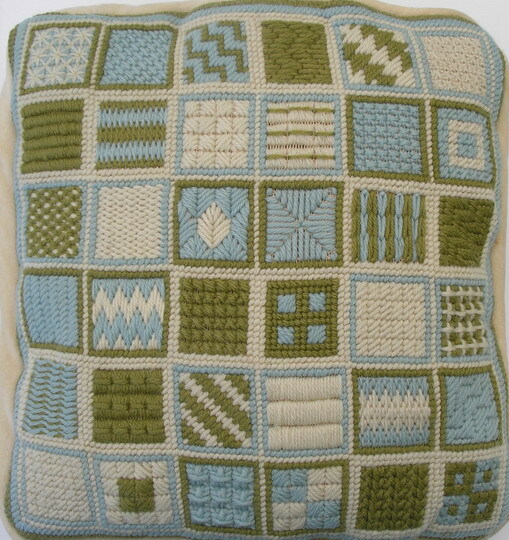 The blue, green and white Persian yarn is the pillow I did to learned many stitches. 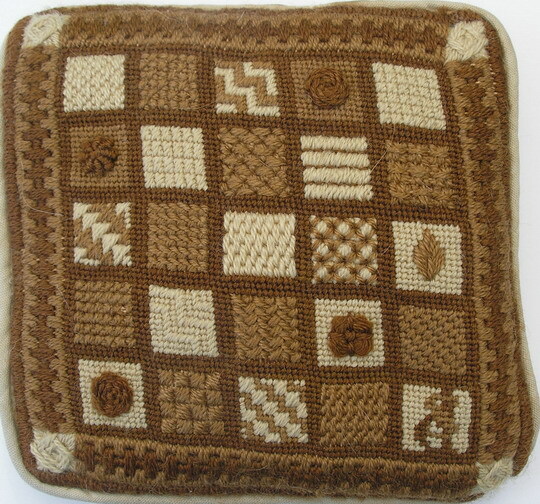 The brown pillow was my second design and I taught this at a local needlepoint shop and at my house for three or four years. 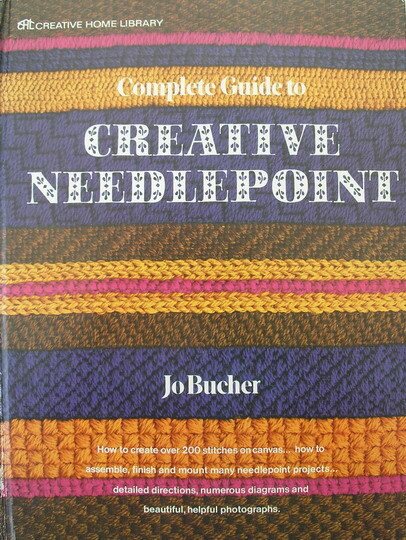 You bought Carol Roma’s book; A New Look At Needlepoint…I gave you a poor picture of the canvas and two line drawings: one road map with the stitch name and page reference number in the book and the second road map gave you color suggestions –ie. lightest shade. Since you got to pick 3 shades of your favorite color tapestry yarn, you had to write the color numbers in. I looked closely at these pillows and I didn’t seperate the strands, let alone lay the strands. Talk about primitive teaching. I found these instructions at a garage sale one time and was so glad I had not put my name on these instructions. I’ve been needlepointing ever since. When I first started needlepointing we had two kinds of wool: Persian and tapestry; if you were really adventuresome embroidery floss, perle cotton and Kreinik . 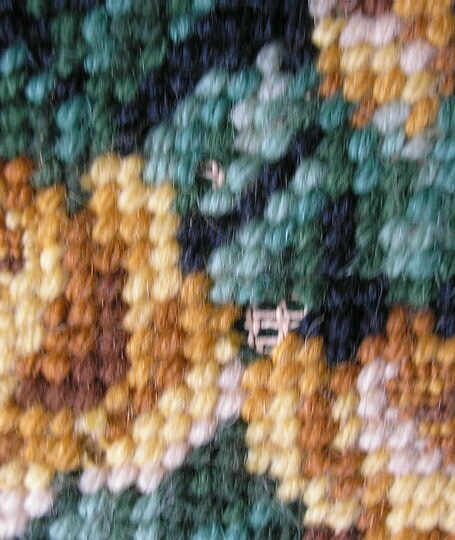 We needlepointed in our hand as you can see by how distorted the pillows are and no amount of blocking keeps them square. We didn’t separate the stands of thread and a laying tool was an unheard of tool. The one thing I never did was allow a finisher to use rabbit glue on my designs. It was suppose too keep your canvas straight after blocking and many shops then recommended this process to keep canvases straight. It didn’t work, attracted unwanted bugs and also rotted the work. And the rest is history. My stash is overflowing but I never have all the right stuff. I’m collecting canvases and charts so my friends will have something to remember me by when they come to the sale my husband has been told to have if something happens to me ( he even knows who he is suppose to call). I have amassed a very large art and needlework library for my friends too. 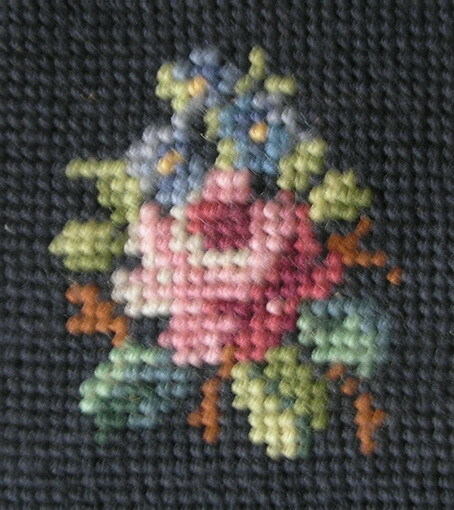 I belong to NAN (www.needleart.org) EGA (www.egausa.org) and ANG (www.needlepoint.org). I’ve completed two levels of teacher certification with ANG. 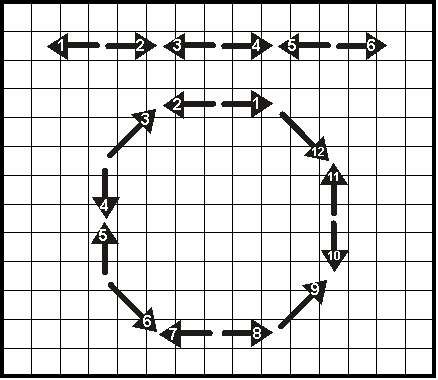 I have designed, taught, learned how to put all this on the computer for myself and other teachers and designers. I’ve taken and take classes from many great teachers. I wrote Diagonal Daring and if I would stay off the web I could get the revisions completed to reprint this book. This is my history what’s yours? I finished reading some of my favorite blogs, finished the laundry, and even started swimming program at YMCA today. I feel like a nap! I’m either catching up or maybe just so far behind I look like I’m winning. The thought was: stories that are and stories that are possible. I think this was also in reference to stash. And I have lots of stories waiting to be told, in fact closets full. But you know something really strange with all that stash, I still always need at least one more thread or just a slightly different color thread than I already own. My stash is never complete! If it were I’d die with the most and win and I know for a fact that man of my fellow stitchers have far more stash than I. So, I will just happily plod along knowing I have more stories to be told along with those I have already told. 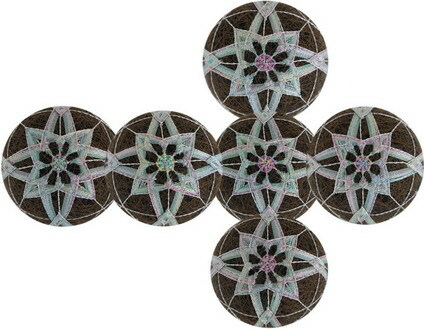 My Temari this month are all the same pattern just stitched with different colors on gray, black or neutral bases. I really thought they were fun. 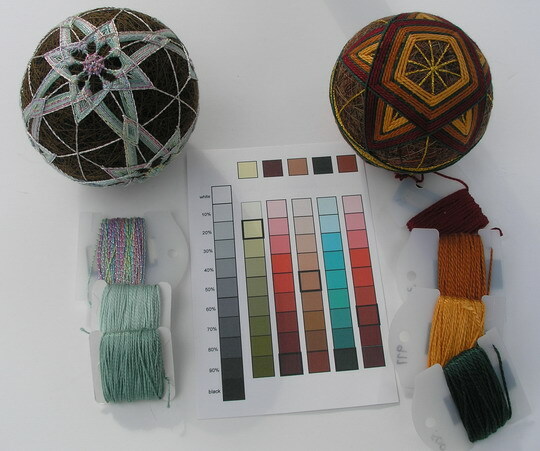 And it shows how one basic pattern has endless possibilities with different colors and threads. I finished these last week, just did not get around to posting until today. I have had the worst cold of the season…at first I thought it was Spring allergies, but now I’m calling it what it is a virus. I am on the mend but I still feel like a bobble-head doll and much to my families joy…have no voice. This too shall pass with my dose of antibiotics and tea. The question for the month was what do I call myself? This is in reference to my art work, because I am a woman and I have many titles…Woman, Wife, Mother, Grandmother, Friend! But in my artwork I would refer to myself as a needle-artist or needlepointer. I am not found of the term fiber, I think it is to broad. I also think stitcher is too broad and crafty. I think we need to define ourselves as much as possible and especially as artists, whether we are a quilter, needlepointer, acrylic painter, oil painter, mixed media, whatever we choose…we are artists and we do make this a better world. I probably should not be doing this today but I’m afraid if I don’t I will be next week before I can get back here. I think my grey mood is directly related to our weather…Who would have thought it would get cold again in late April…I am really tired of cold weather. Luckily and hopefully, it is not going to damage the foliage. Anyway, I struggled with this months TIF, almost did not do it. I was expecting a color scheme of bright or pastel colors…after all we in the northern hemisphere are thinking spring and warm weather. Had to change my mind set and work with what was given. Change is a sometimes difficult especially if if goes against your grain or mind set. I decided that even though changecan be difficult it is worth a try especially on the TIF. I have thought of these TIF projects as something that should be quick and fun. Simulating, mind stretching but not overwhelming or mind boggling. So I incubated…then because of another project I am following I decided to make a color card using these colors ( Note: since we all perceive color one way and our computers display colors differently these colors may not agree with other TIF participants) I did take the RGB percentages and entered them into my color program so I think these colors are close. Then I lived with this card for a few days and came up with a few ideas to explore. 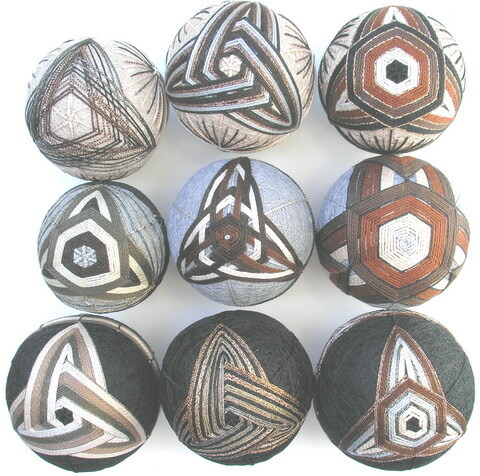 I have chosen for the time being to continue to make Temari Balls even though I am a needlepointer at heart. I have known how to make Temari Balls for a long time and have made a few a year but this year I wanted to really get back in the swing (change) and fine tune my skills at this art. And I think the only way to get better at something is to practice, practice, do do. So the media again is Temari (no change here). 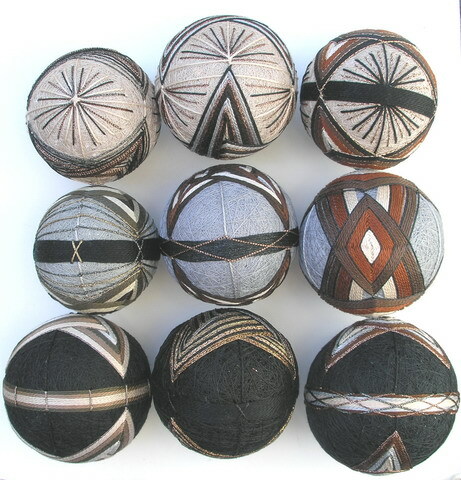 My first Temari Ball was as close to the original colors as my mind set could get. While stitching this ball I thought about Sharon and all of you in the Southern Hemisphere who are entering the fall and winter seasons. I am glad I live where there is a change of seasons, each season has it’s own beauty. But then I had to do a second Temari Ball to change my thoughts back to spring. I used the same family of DMC green to link the balls together. Next week is guild meetings and family business hope I get stitching time in somewhere. And most of all I hope the Mother nature decides to blow her warm breezes our way and turn our world into full blossoming spring. Yesterday, I went to local ANG guild meeting and the program was Blackwork. I could have used the suppilied thread but since I knew I would probably complete this at the meeting and I happen to still have the colors from the March TIF still in my stitching box…Well…It was just a given…another TIF and an ATC too! 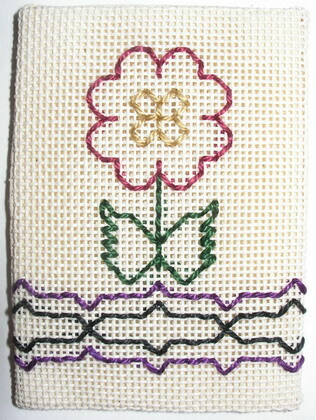 This little Blackwork technique was worked in 2 methods: The flower and leaves were worked in a “Back and Run” Stitch; it is a back stitch followed by a running stitch. The border on the bottom is a “Double Running Stitch”. Then I committed a great faux-pas… I missed one of my only two Granddaughter’s birthday! It was kind of a honest mistake but it made me feel awful. 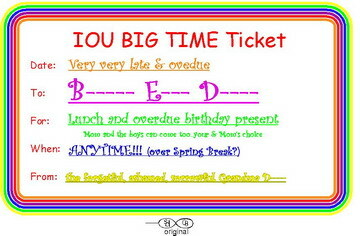 I sent her an IOU ticket and today took her to lunch complete with cake and a shopping trip. Her gifts were Webkins http://www.webkinz.com/ and cash stash pad. 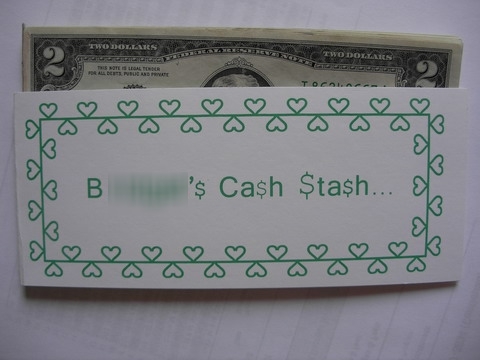 I made the cash stash pad with unused $2 bills and a glue stick. Make sure all the bills are sqared up on one end and rub over a glue stick. I also put a tiny piece of ribbon over this glued end. Then I made the cover using legal sized paper. Glued the cash to the inside and folded. And a gift anybody would love to get. I think I’m out of the dog house now and I won’t make this mistake again! Today I spent the better part of the morning baking sugar cookies…rolled iced with sugar and baked. Decided not to ice these so I just used egg white and decorative sugar…and 7+ dozen later I decided that was enough green. I also ran out of green sugar and wasn’t about to send better half to the store for green sugar. So… I started the Easter cookies for next week. About 2 dozen sugar cookies ahead of the game. 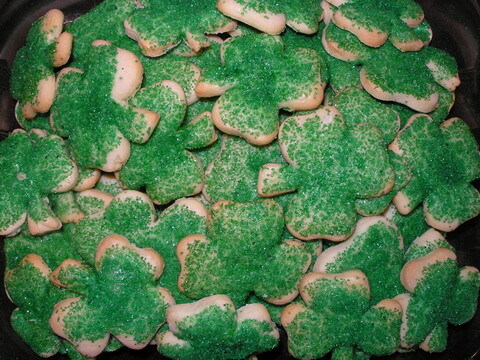 These I am going to ice with royal icing and try my hand at using decorator tips and pipe decorations on the cookies. Normally I just ice them with a spatula and if you’re luck I might throw on some decorative sugars. No one has complained yet but I don’t think many people bake from scratch anymore. Maybe I better re-consider the decorating. Don’t want everyone to expect this every holiday. Anyway I went to the framer and left two birth announcements I have had stitched since before Christmas 07. I put them out of sight and forgot them. They are safely at the framers now and maybe the recipients will get them before Christmas 08. Also went by fabric store and picked out a couple materials for a project that I have been thinking about doing. 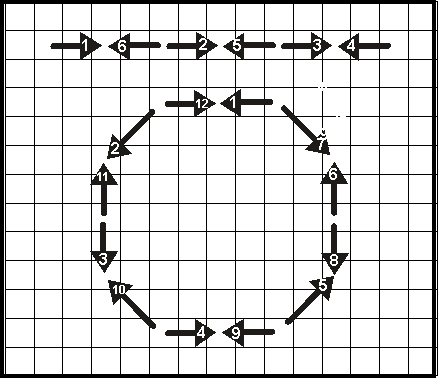 How many times I have started a project and had a pre-conceived idea how I would like to finish the project? Too many! And usually I either have used a wrong color or can’t find exactly what I am looking for. I found two fabrics for finishing one project but couldn’t find anything for the other idea. small details again…I’ll talk to my finisher before I start the other project, she always has great ideas. But I do have two fabrics for one project and maybe I’ll just do two. But this reminded me of noticing the small details of the March TIF. I guess maybe I am beginning to notice the small things. Finished my day at the craft store for the cookie decorating tips and the grocery store for food. Now I think I’m just going to curl up in my favorite chair and see what other blogs have to say and surf the evening away.